We drove out to South Dakota in September to see our friend, Ranger Stef. We trailered the small motorcycles so we could ride a bit in the Black Hills. Trailering 3300 miles round trip was a bit of a drag, but worth the effort. I took a few pictures with my happy snapper, but mostly left that to hellon2wheels and her fancy new camera. I'd seen Mount Rushmore, of course, but I'd never heard of Crazy Horse -- I looked at the original size. That was cool. Rushmore was a government project from day one. Crazy Horse is privately funded, so there is a whole complex below it designed to separate tourists from their money with relatively little pain and much efficiency. 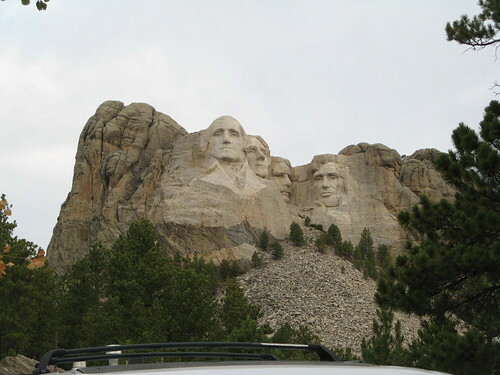 I believe all of the presidents' faces could fit on Crazy Horse's. It is huge. kewl. I Wiki'd the crazy horse memorial - didnt know there was such controversy.